UPDATE: Mike "The Situation" Sorrentino and Lauren Pesce were thrilled after spending the day with loved ones at their wedding shower. The engaged couple told E! News exclusively, "It was such an amazing day celebrating our love for each other with all of our closest families and friends! You felt the love in the room. We are excited to see what the future holds and can't wait to share with our family, friends and fans." Jenni "JWoww" Farley was all smiles on Saturday as she and BFF Nicole "Snooki" Polizzi turned Mike "The Situation" Sorrentino and his fiancée's wedding shower lunch into a double mother-daughter date. Mike and Lauren Pesce, who announced their engagement in April, celebrated their upcoming nuptials at the Osteria Cucina Rustica restaurant in Marlboro, New Jersey with family and friends. Several of his Jersey Shore co-stars were among the guests. 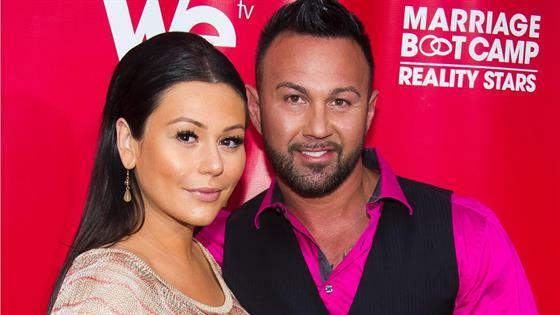 This marks the first time JWoww was seen in public since it was revealed on Thursday that she has filed for divorce from husband Roger Mathews. She attended the shower with their daughter Meilani, 4, the eldest of their two children. Snooki arrived with her and husband Jionni LaValle's daughter Giovanna, who is also 4 and is the youngest of the couple's two kids. Snooki and JWoww also both posted pics of their daughters standing together in front of a wall adorned with white hydrangeas and lemons. New Jersey's Rosie Posies provided flowers and guests walked away with party favors including oil from Twisted Branch, candles from Jersey Shore Cosmetics and cookies and cake from Confections of a Rockstar bakery. "Here's a pic of us at our first red carpet event. We were so young. @jwoww #TheHitchuation," wrote Snooki. "The best of friends," JWoww said. Snooki also posted on her Instagram Stories a video of Meilani playfully teasing Giovanna while sitting at table having lunch. "They're me and JWoww after a bottle of wine," she wrote. Snooki and JWoww both shared videos of their daughters dancing and pretend-fighting. "Deleted scenes of Vegas @jerseyshore @snooki fight round 16," JWoww wrote. JWoww appeared to be in high spirits at the shower. She playfully gave Snooki the finger when she filmed her bestie having a conversation at the table about the Keto Diet with Jersey Shore co-star Vinny Guadagnino. Angelina Pivarnick and her fiancé Chris Larangeira also attended the shower. In a group pic shared by Mike, Snooki and JWoww, the bride-to-be and groom-to-be and their Jersey Shore guests stand in front of the flower and fruit wall. "The Hitchuation Wedding Shower," Mike wrote. At the party, guests enjoyed custom-made donuts by the Broad Street Dough Co.
"Mike and Lauren have been customers at my shop since I opened," owner Desdemona Dalia told E! News. "They are both fun and creative...always coming up with awesome combos at the shop! They were very involved in the design process. Once they had their theme and communicated what they had in mind, we were off and running to try and create their vision. They are two amazing individuals and truly the sweetest couple ever! Always tons of fun interacting with them." Dalia said Mike and Laurent both love "The Antonio" donut, made up of two layers of cannoli cream, and finished off with warm chocolate and powdered sugar, and "The Ariana," a triple-layer Italian rainbow cookie donut made up of one layer of black raspberry preserves, one layer of Nutella and then finished off with warm chocolate and powdered sugar. The wedding shower took place a week before Mike is set to be sentenced in his tax fraud case in New Jersey. In January, he pleaded guilty to tax evasion and faces a maximum sentence of five years in jail. Mike and his fiancée have not announced a wedding date but are expected to wed in the coming months.